DR5000 is a 10 bit 4:2:2 contribution grade Integrated Receiver Decoder (IRD) dedicated to professional contribution over satellite and IP / ASI networks. The Kyrion DR5000 is a new Hardware Integrated Receiver Decoder dedicated to professional contribution over satellite and IP / ASI networks. The Kyrion DR5000 is a single channel Decoder with outstanding capabilities providing easy setup and fast signal lock while achieving great robustness. The Kyrion DR5000 receives video feeds on 4 selectable DVB-S/S2 QPSK, 8PSK, 16APSK and 32 APSK inputs, 2 ASI inputs and 2 IP inputs. Capable of decoding all profiles from Standard Definition to High Definition, either MPEG-2 4:2:0 or 4:2:2 or MPEG-4 4:2:0 and 4:2:2 up to 10-bit. The Kyrion DR5000 features clear and complete front panel and web interfaces with confidence monitoring that meet all operational expectations with quick access to configuration menus and immediate settings ensuring a fast receiving setup. 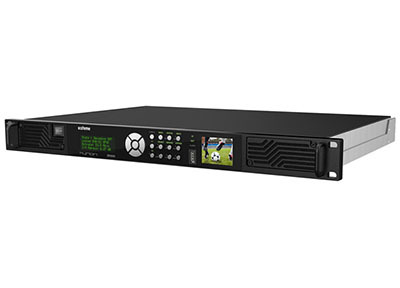 Based on ATEME‘s unique FPGA design, the Kyrion DR5000 permits a complete software upgradeability SD to HD or 4:2:0 to 4:2:2, providing the broadcasters, satellite up-links, service operators, and the DSNG Users to benefit from the state-of-art of video compression techniques.